East Timor Legal News 21 August 2012 ETLJB The new East Timor Minister of Justice, Mr Dionisio Babo-Soares, has announced plans to establish a Criminal Investigations Centre during the current legislative term of the V Constitutional Government. “We are thinking about establishing a Criminal Investigation Centre, which is important because up to now this role has been filled in by the Criminal Investigations Services (SIC) Unit,” the Minister said in Dili recently. The Minister added that the managerial staff at the SIC will need to be better qualified and have higher competencies. Member of Parliament (MP) Mateus de Jesus said this was a change for the better because the Centre would enhance the justice sector. “We don’t have a centre such as the one planned, so this if great forward thinking,” said MP de Jesus. He reiterated the Minister’s call for highly qualified and competent staff to manage the future Criminal Investigations Centre. The new Minister of Justice replaces the former disgraced Minister for Justice in the prvious AMP government, Mrs. Lucia Lobato, who has been convicted for abuse of power and is facing a prison term of 5 years for illegal conduct in a contract procurement process while she was head of the Justice Ministry. 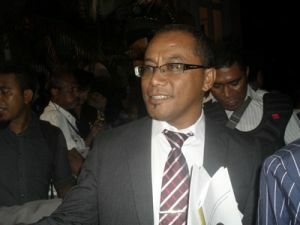 Mr Babo-Soares is also the Secretary-General of the National Congress for Timorese Reconstruction (CNRT) which won the biggest share of the recent Parliamentary vote. He holds a doctorate from the Australian National University and was previously the Deputy-Director of The Asia Foundation's office in Dili.